Would like to thank Bacon Sakatani, president of the Japanese American Korean War Veterans organization, for inviting me and my wife to the annual Japanese American Veterans’ Joint Memorial Service, which honors all the Japanese Americans who gave their lives for their country in all of America’s wars. 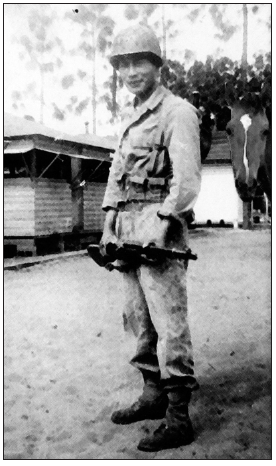 The ceremony will be held on Saturday, May 24, at 11 a.m. at the Japanese American National War Memorial Court at the Japanese American Cultural and Community Center, located on San Pedro and Third streets in Little Tokyo. Although I am a World War II vet, I am seldom invited to attend veterans’ events. No, I wasn’t a war hero, but I did serve in the U.S. Army during the war, so I thought I would toss a photo of me wearing my Army uniform, taken in 1943. I know most of you will say, “Hey, that doesn’t look like you.” I was 18 years old when the photo was snapped, so that’s understandable. Just proof that I did wear Uncle Sam’s uniform during WWII. There was a time when horse racing was a part of my life. I used to get out to the track at last once a week. These days, I might get out once a year. Of course, the one horse racing event that still attracts my attention is the Kentucky Derby, which was run this past Saturday. Yes, since one of my friends said he was going out to Santa Anita to bet on the Kentucky Derby, I gave him my money to bet on Corey Nakatani’s mount in the big race. His mount went off at 16-to-1 odds, so most will think it was kind of stupid to place a bet, even to place, on his mount. Well, he finished sixth in the 19-horse field. Those of you who saw the results of the Derby know that a 30-to-1 longshot finished in second place and returned $31 for a $2 bet. So betting on a 16-to-1 entry didn’t seem that great. If Nakatani’s mount had finished second, he probably would have paid about $15 or half of what the actual second-place finisher paid, and it’s a lot easier to figure than a 30-to-1 longshot finishing second in the Big Race. That’s the way horse racing goes. “In your April 29 column, you mentioned that the tallest JA that you ever saw (as a basketball player) was 6’4” Nisei from Placerville, near Sacramento. If the person you are referring to was George Goto from the postwar era, he was actually from nearby Placer County and not from Placerville. “He was actually 6’1” and is about the same age as you, 88. “In those days, that was extremely rare for a Japanese American to be that tall. Nowadays, it is becoming more common since the JAs are getting away from a rice diet. I understand that this is even slowly happening in Japan. Even one of my sons is 6’0”. Everyone on me and my wife’s side of the family barely made it to 5’6”. “Anyway, George Goto was quite an all-around athlete, playing basketball and baseball in high school at Tule Lake and in college at Placer Junior College in Auburn and then on a basketball scholarship at Stanford. “He received an offer to play for a Japanese major league team in Tokyo but opted to pursue his career as an educator/coach. 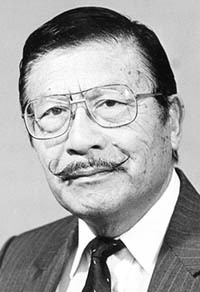 He spent many years pitching for the Placer JACL team in the ’50s, while coaching and teaching at Sierra College in Rocklin and finally becoming the athletic director there until he retired. Thanks for the nice letter, James. It contained a lot of information that I never knew about and probably ditto for many of the readers of my column. “Sad to report this, if you don’t know already, that your favorite restaurant on Western Avenue and the 405 Freeway is now closed. They have a written note on the front door, which read, ‘Closed due to power outage.’ No message as to when they are going to reopen, if at all. Thanks, James. Yeah, I’ve driven by the place at least three times and found it closed. You would think they would put up a sign saying when it might open again. My feeling is that it is shut down for good. So, now, my wife and I are looking around for another place to have breakfast. As I noted in one of my columns, perhaps we’ll be eating breakfast at home from now on. Good choice, but the wrong answer. The world’s biggest gambling city is Macau, which is located near Hong Kong. Macau gamblers bet more in one day than those playing in Vegas. Kind of hard to believe, but gambling in Macau rose 19 percent last year and is expected to go up even higher this year. It’s the only place in China where casino gambling is legal, which may account for the huge amounts bet in Macau. By 2017, it is expected that gaming revenue will increase to $77 billion. Investors in Macau casinos have profited thanks to the tremendous growth. They are placing billions more in expansion projects in Macu, betting that the phenomenal growth over the past decade won’t fizzle. One of the minus factors is the limited hotel room growth in the area. Delays in major infrastructure projects and a labor shortage are also becoming a problem. The growth in Macau is part of a surge in casino building across Asia, including Singapore and the Philippines, as countries in the region try to get a piece of the action. They are benefiting from the rise of wealthy gamblers in both mainland China and other countries in the region, including Japan. Does this mean we’ll be seeing fewer Chinese and Japanese visitors in Vegas? Well, to those of us who are Downtown visitors, we don’t see that many from China and Japan because most of them go to The Strip. I am sure that because of its geographic location, Macau will draw Chinese and Japanese visitors, but I think eventually they will begin to return to Vegas because the atmosphere in the Nevada city is a lot different from Macau. Most Japanese Americans know what umeboshi is since we grew up with it being part of our diet prepared by our Issei parents. Umeboshi is a salty, sour pickle that we often eat in a musubi or rice ball or when we are sick. It is usually served with breakfast rice with a cup of tea. 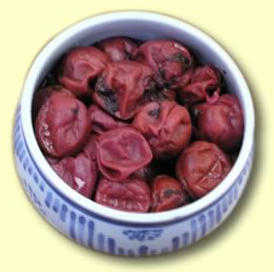 A food authority describes eating an umeboshi as the culinary equivalent of taking a cold shower. The abrupt, searingly tart, tangy, salty taste jolts the eyes open, shakes the stomach awake, sandpapers off any staleness from the taste buds, and gets the day off to an unforgettable start. We have always known umeboshi as a pickled plum, but it is actually more closely related to a Japanese apricot, prune or American plum. If the pit is examined, it resembles an apricot more than a plum. So, how are umeboshi made? From mid-June to mid-July, the rainy season in Japan, the fruit is soaked in water to get rid of its bitter taste. Then it’s drained and wiped dry and sprayed with shochu or Japanese distilled rice liquor. They are then put in a container for pickling, mixed with salt and weighted down with a heavy stone. Pressing the fruit down is very important in the making of umeboshi, which takes about six weeks. After that, perilla leaves or shiso are washed, sprinkled with salt, excess liquid squeezed out, leaves broken apart and combined with the salted ume. The heavy stone is again placed over the mixture, which is allowed to pickle for another week. During a sunny day at the end of July, the fruit is dried outside for three days and nights. The traditional method of making umeboshi is a “lactic-acid-forming bacteria growth,” one of the oldest and safest way of fermentation process. Salt, rice vinegar and shiso leaves are added. After a year of aging, the remaining red liquor is bottled and sold as umeboshi vinegar. Umeboshi is an alkaline food that helps discharge wastes and cleans our bodies, and if our bodies are clean, our bodies will be revitalized. A musubi is made ahead of time to be eaten later. Adding an ume in the center of the rice ball will prevent the rice from going bad because it acts as a sterilizer and antibacterial agent. As I have mentioned from time to time in my columns, we have three cats in our house. The first one has been with us about four years. We picked her up at the local animal shelter. Then about two years ago, we found another one that wandered into our house. We decided to keep her. Our third son had a cat, but he got married a year ago and the apartment he and his new wife wanted to rent didn’t allow pets. He asked us to take care of it until they purchased a house. So, we have three cats. One of them, for reasons unknown, wants to sit on my desk when I’m writing my column, which is very disturbing. So, I lock the door to my “office,” but every time my wife needs to pass through my “office,” she lets the darn cat in and you guessed it, she jumps on my desk. If my writing seems to be falling apart, now you know the reason. George Yoshinaga writes from Gardena and can be reached via e-mail at [email protected] Opinions expressed in this column are not necessarily those of The Rafu Shimpo.